When it begins getting colder outside, many people notice their energy costs rising steadily. This makes sense, as more power and gas are needed to keep a home warm and to power devices. Due to these increasing costs, many people wonder what they can do to save a few dollars during this time of a year. If you fall in this category of energy and cost savvy homeowners, then you are in the right place. Use the energy saving tips here to help you save money this winter. When you are turning on your thermostat, you should try to turn the heat up slowly, instead of cranking it up to the desired high temperature right away. If you raise the temperature in your home quickly, it is going to activate the heat strip. This can use quite a bit of energy all at once. A better and more cost-efficient way to heat your home is by choosing a lower temperature at first and then increasing it gradually. When you keep your home’s thermostat at this range of temperatures, it will help to maintain consistent warmth; however, it will also help you avoid overloading your furnace and increasing your energy costs. During the day, you should offset the heat generated by your furnace by allowing natural sunlight to come in your home. If you plan to leave for an extended amount of time, choose a lower temperature for your thermostat, such as 60 to 63 degrees. Don’t ever turn it off completely in the winter. While a portable heater may seem like a good idea, the fact is, they are quite costly to run. They can increase your energy costs and aren’t very efficient for home heating. Even worse, they pose a serious fire risk. While they may be good for “spot” heating, they should never be used as a primary source of heat, as they are expensive and inefficient. Believe it or not, a bare floor, such as concrete or hardwood actually contribute to the loss of heat in your home. Based on how much floor insulation is present, quite a bit of heat may escape through your floors. You can easily and affordably cover your bare floors with rugs or carpeting This will help you retain heat in your home, reducing energy costs. If you want more tips about how you can save energy this winter, then it may be time to call the professionals. 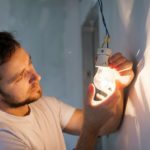 An electrician can evaluate your home and help you figure out areas where you can cut back your electrical costs. Don’t just settle for high energy costs. There are steps you can take and things you can do to avoid these. Use the tips here as a starting point to help you save money.